To better engage her students, this adjunct details how she used our platform to track their progress (and find out whether they were really paying attention in class). This summer I had the opportunity to take the Open Assembly platform for a demo in my image-based humanities course at a large urban public institution. As a teacher for 14 years in some way or another, I have developed my own style of teaching that I’ve honed over the semesters. I’ve found that as my confidence in my voice grew, I abandoned the podium to which I originally found myself tethered. Because of this style of instruction, I did not teach directly from the OA platform, but I did spend many hours crafting the course within OA using information that reinforced what we covered in class. While some students are able to take notes and still follow along, for others this proves difficult. This summer I had two foreign students who were somewhat new to the U.S. Their writing was fine, but when speaking with me, it became clear that they did not understand everything I was saying. This is problematic in an accelerated course where content is covered quite rapidly. Both of these students greatly benefited from reviewing the content on our OA course page, where they could review the learning materials at a slower pace and re-watch the video content until they understood. This brings up the way I enjoyed using Open Assembly the most during these courses: taking advantage of the ANALYTICS function to track students’ access to resources that I uploaded for the course. Through blank stares and low test scores, I had a hunch that certain students were not following along. My suspicions were confirmed when I saw that they had not accessed either the readings or the modules on the OA platform. While it seems a little “Big Brother,” it is a useful tool that allowed me to follow up with students who were not accessing the course materials. Another significant benefit of Open Assembly was that for the first time, every one of my students had access to the assigned textbook. Prior to this semester, I had not used an open textbook before. I found an excellent open educational resource (OER) alternative to the (somewhat costly) textbook I had been using before, and assigned it to my latest crop of students. For once I had a level playing field in my classroom, with every student being able to afford this (free & open) textbook. One of the ways that I plan to use the Open Assembly platform in the future is for constructing debate and assignments that can take place outside of class time. Case in point: there is immense debate over a group of sculptures known as the Elgin marbles or Parthenon marbles. These relief sculptures decorated the interior and exterior of the Parthenon temple that sits on the Acropolis in Athens, Greece. Acquired by Lord Elgin during his time as the British ambassador to the Ottoman Empire in the early 19th century, they are now on display in the British Museum. This debate involves repatriation of artifacts and the question of who rightfully “owns” the Parthenon marbles. The Greek government contends that they were taken out of the country illegally, and there are numerous documents and video clips giving alternate sides of the argument. In a group-based discussion exercise, students often need prompting to start the debating, but once started, many join the conversation. Unfortunately there is not enough time in the semester to devote a whole class to this exercise, so this is how I plan to use the Open Assembly platform: through videos integrated within my curriculum, students will be able to form their opinions about the status of these sculptures, then make a statement through the COMMENTS interface, forcing them to take a position. This is followed up with a formal writing assignment where the student has to make a statement and then defend that decision in a two- to three-page written response. I’m really excited about the debate possibilities that Open Assembly can bring to my classroom. Edtech is Widening Skills, Achievement Divides. Why Not Narrow the Engagement Divide? Despite efforts to provide technology access to poor and minority students and narrow the “digital divide,” educational tech may not be leveling the playing field after all. A recent Hechinger Report story focuses on research conducted in two polar-opposite Philadelphia neighborhoods over a 10-year period. Susan B. Neuman of New York University and Donna C. Celano of LaSalle University studied academic and economic inequalities between children from affluent Chestnut Hill and those from struggling Kensington. 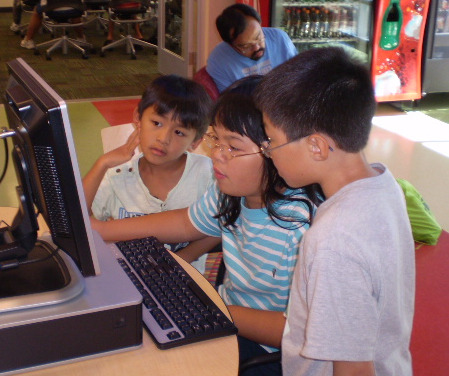 They explored how kids used computers at public libraries, where they discovered just how differently poor and affluent students took advantage of the tech resources. Chestnut Hill kids often went to the library with adult family members, who sat with them and answered questions or directed them to educational material. In contrast, the Kensington children tended to lose focus and interest while using the computers, and parents didn’t usually guide their children’s online learning. Poor children also bring less knowledge to their encounters with computers…Not only are affluent kids more likely to know how to Google; they’re more likely to know what to Google for. Why not attempt to work with the way that less-advantaged students prefer to interact with content: via entertainment or games? Why not try to meet these students on a 1:1 basis, as opposed to the one-size-fits-all approach? Open educational resources (OER) for “productive gaming” could provide a solution; otherwise, poorer kids will fall further behind. What if we developed an OER-based “Google Search Game” designed to support game-loving students in becoming more effective explorers in our knowledge economy by using tools that make the most sense to them? Perhaps we also need to curate materials in OER repositories the way the best instructors do in prosperous classrooms—based on context, learning style, and skill level. This would give less-advantaged students access to higher-quality digital learning resources that narrow that “engagement divide” and the skills and achievement gaps—i.e., that foster and achieve “deeper learning” (expanding what students learn, deepening the experience through which they learn it, and improving the benchmarks for measuring their knowledge). The William and Flora Hewlett Foundation believes that “OER provide a powerful means to grow the impact of Deeper Learning” and supports grantees such as Expeditionary Learning who are developing Deeper Learning OER resources. I have either the gift or curse of having eclectic interests. I major in engineering physics and environmental studies at a school that requires I take a range of liberal arts courses to graduate. Even so, I find myself interested in even more, to the point that employers have told me I have too large of a range of interests. That’s where MOOCs come in handy. I have used online resources to supplement my education, and the ability to do this continues to grow. Since my school does not have a large course offering for engineering and I have little room to add courses that are not for my major or graduation requirements, resources such as MIT OpenCourseware (MIT OCW) come in handy. MIT OCW specifically is an amazing source, because it is not required to follow a class- although for many you can- lecture notes and videos are available just for reference! I also used MIT OCW in order to get an idea of what I would be dealing with when I took ‘Modern Physics,’ (totally mind boggling ideas in case you were wondering). From learning more about a topic I want to work with or preparing for next semester courses, their potential is invaluable. Large universities are much more capable of providing of these courses. I have no way of taking courses specifically in nuclear energy and engineering at my home school, but online, the possibilities are endless. I can now tailor my skills to specific jobs, and while my transcript will not reflect it, I can still market myself in the workforce with the learning I have gained. Beyond that, those of us that crave knowledge just for its sake have the opportunity to pursue it from open, high-quality sources. Why Publishers Aren’t Too Worried About Open Textbooks | Innovation Memes. Article by Fred Beshears from 2010 still rings true re. the ongoing challenge of persuading faculty to select Open Textbooks. Have you ever wondered how to download and share digital content legally? How do you let people know that you want them to reuse your own work? Creative Commons licenses can help you do both. These Kiwis will show you how. Interesting video about the experience of 2 professors at UOW filming their first video segments for a new MOOC. Very cute trailer intro! The University of Wollongong is partnering with Open Universities Australia\’s free online learning platform, Open2Study, in the production of 2 MOOCs over the next 2 years. This video clip charts some of the highlights of making our first MOOC. Here we see Graduate School of Medicine academics Kylie Mansfield and Lyndal Parker-Newlyn working with Open2Study Content Development and Production team over 5 days in Melbourne to record high-quality video lectures for their \”Understanding Common Diseases\” course, which opens for enrollments on October 14th 2013.
via Kylie And Lyndal Make A Mooc – YouTube. Open Assembly will be presenting its platform for assembling and sharing resources to NYC-area educators at Tech-Ed Day on October 21, 2013 at the Cradle of Aviation Museum, Garden City, NY.